So, it’s Sunday morning. Coffee ready, music playing. I take out my stickers. I bought this set from FruVesas Printables. It is the Ocean Roses printable. I do not have an Erin Condren planner (yet) but I do use stickers on my Teneues planner cause I ❤ decorative planning. My planner has two pages per week. One with the days (horizontal layout), the other page is a lined notes page. I have written down the things I want to get done in each box. I have used little tear drops and written the things I want to be doing everyday. So, the tear drops stand out and I do not have to write my repeated tasks on every single day’s box. What I want to be doing everyday? Read a bit of my book, and ride my stationary bike. 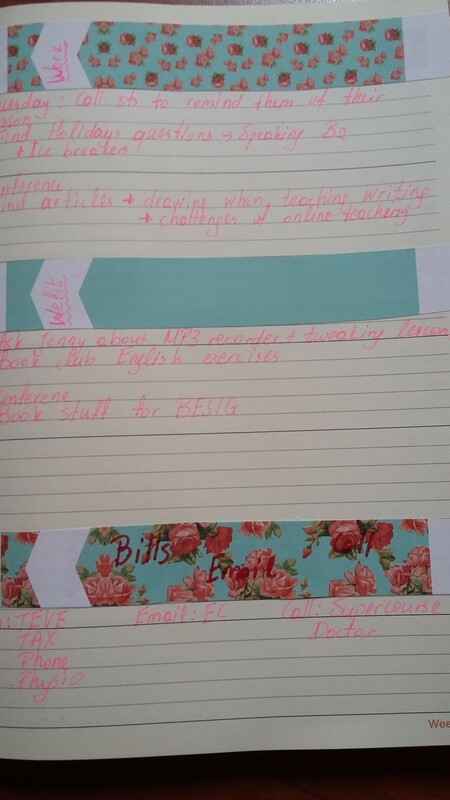 I used a half box sticker as a header on the last column and have written down all my blogging ideas. 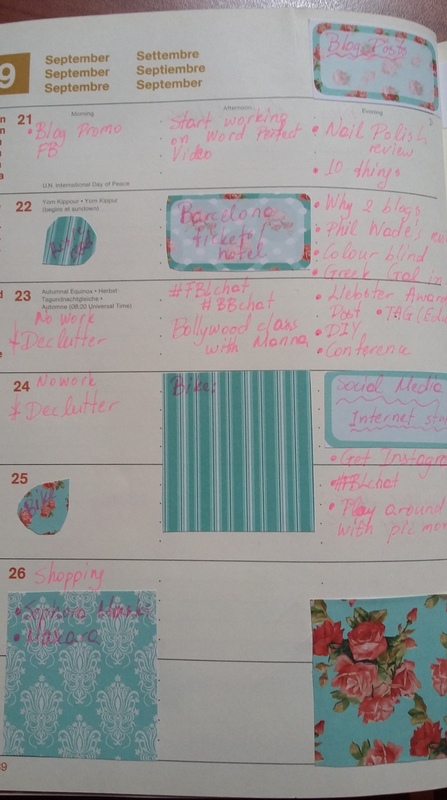 The thing I like about this particular planner is that there is a notes page next to the page with the days. I write all my to Dos there. I can write whole sentences which is great cause I can think a bit more and see what I wanna do. One banner is for my face to face lessons, one for my online work, and one for bills/calls/emails. So, far this decorative planning is working great for me cause I like pretty stuff and it is kind of inviting. I spent about 45 minutes cutting/ sticking and writing. If things come up during the week, I will add them later. I sort of have an overview plan and then I add things throughout the week. Also, if you are wanting to buy an Erin Condren life planner, I have a $10 off offer for you guys if you purchase the Erin Condren Life Planner by pressing the words $10 off my ELCP below (this is a referral link). How do you make your spreads? Please leave a comment in the comments section. Have a good week. Follow my blog if you like these posts. I write in different colors and use fancy paperclips in my work planner. I am colourblind so different colours doesn’t work for me. I use bullets and little x marks, stickers and whatever I can!!! Thanks for stopping by. I seriously need to work on getting more organized. Your system makes me feel like an amateur! 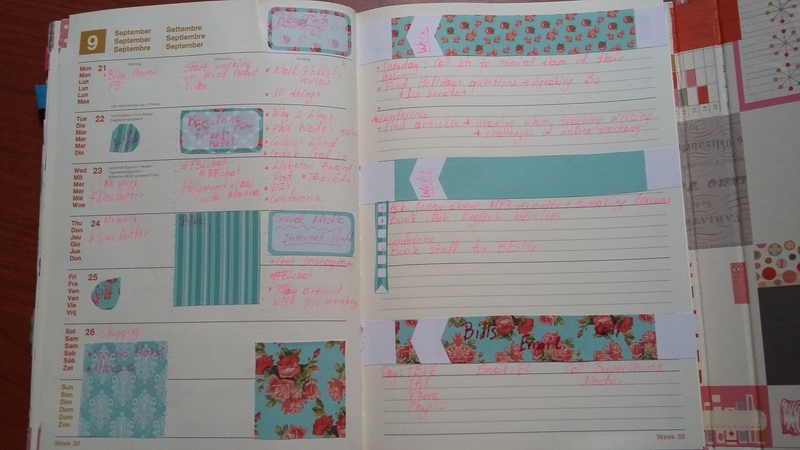 I’m a huge planner lover, it’s always great to see what other people have for set ups. What planner is this that you are using? Thanks for stopping by. I am using a Teneues planner. I like it cause every week there is a notes page and a weekday page. I make little comments on the page with the days and loads of notes on the other page. I have just ordered a Happy planner to review!! What’s your favourite planner? I’ll look them up for a nosy! Currently I am using the Passion Planner, before which I was a massive user of Filofax. I’ve seen one from Seeso that appeals greatly however they no longer make it. Sad faces!